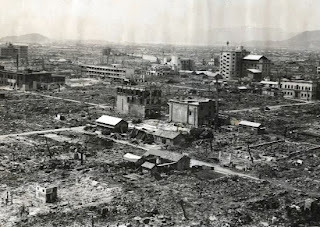 Nagasaki, Japan, a few months before the "Atom Bowl"
On August 9, 1945 the second atomic weapon ever used in warfare—Fat Man, a plutonium fission bomb—was detonated over Nagasaki, Japan. 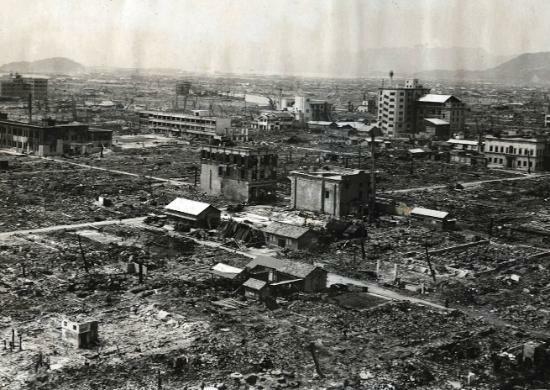 Just three days had passed since the first weapon—Little Boy, a uranium fission bomb—had leveled Hiroshima. It is Hiroshima, though, that still gets “all the press” because it was the first. And being first in the atomic age has its dubious benefits. Most people, for instance, remember that it was the Enola Gay that dropped the first A-bomb, but leave it to the History Channel nerds to know that the BocksCar (aka Bocks Car) delivered the second. And while Paul Tibbets became a household name for piloting the Enola Gay, Charles Sweeney’s name quickly faded from the national memory as the man who flew the second plane. The examples go on, but in one thoroughly bizarre category Nagasaki triumphs over Hiroshima—post-atomic football! On January 1, 1946 occupying U.S. Marines staged the very first (and the very last) “Atom Bowl” amid the radioactive rubble of the runner-up target city. According to an excellent 2005 New York Times article on the game, the idea came from Major General LeRoy P. Hunt who was the Second Division commanding officer. He wanted an event that would lift the morale of the troops during the holiday season and recommended a football game. Hunt probably favored such a competition because there were quite a few college and professional football stars serving under him. The most talented of these Marines, Heisman Trophy winner Angelo Bertelli and Bullet Bill Osmanski, a fullback for the Chicago Bears, became the captains of the opposing “Atom Bowl” teams: The Nagasaki Bears (Bertelli) and the Isahaya Tigers (Osamanski). The makeshift gridiron dubbed “Atomic Athletic Field No. 2” was cleared of debris, but because pieces of glass remained, it was agreed upon that the game would be two-hand touch instead of tackle. The bleachers and the goal posts were pulled together from pieces of wood found near the field. Concern about lingering radiation was, apparently, disregarded by everyone. 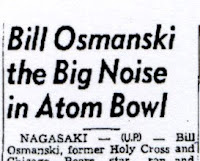 Mike Bertelli, the son of the Nagasaki Bears captain, told the Times that his father and Osmanski had made a pact beforehand to try and make the game a tie in order to keep things cheerful in the ranks. But, at the last minute, Osmanski could not resist winning and kicked the extra point. The Tigers claimed their victory before a crowd of over two-thousand servicemen and women and a few mystified Japanese survivors. Nagasaki, Jan. 2—(U.P.) Bill Osmanski, former Holy Cross and Chicago Bears star, ran and kicked his “Nishahaya [sic] Tigers” to a 14 to 13 victory over Angelo Bertelli’s “Bears” in the first “Atom Bowl” held here yesterday. Several thousand servicemen and women huddled in the bitter cold on the sidelines of the gridiron, which the Marines carved out of the dust and rubble of this atomic bomb target city, to watch the game. Osmanski, a first lieutenant in the Marines, scored both touch-downs for the “Tigers” and booted both extra points—all in the second half—after the “Bears” captain, Navy Lieutenant Bertelli, former Notre Dame great, had passed his club to a 13 to 0 lead at halftime. The Bears’ tallies came on passes from Bertelli to George Pukoski, formerly of Duquesne, and Pat Donat, former Franklin High School (New York) player in the first and second quarters. Bertelli made one conversion good but missed the second. cual es la mejor casa de apuestas? For more info ask admin.